The word praline is a generic term for any sort of candy made with nuts. In the early renditions of the praline they were made with almonds. As the early Frenchmen arrive in New Orleans they brought them to their new colony and found the land was plentiful of pecans tress. During 19th century, New Orleans chefs substituted pecans for almonds, since they were plentiful. Cream was added to thicken the confection, and voilà the American praline was created. For the record, the local and proper pronunciation is “prah-lean,” while the nut most commonly used in it is pronounced “peck-on.” Just remember that, in New Orleans, a word pronounced “pray-lean” means nothing. The praline has become an inconic food in New Orleans just like the P’boys, gumbo, jambalaya, and beignets. 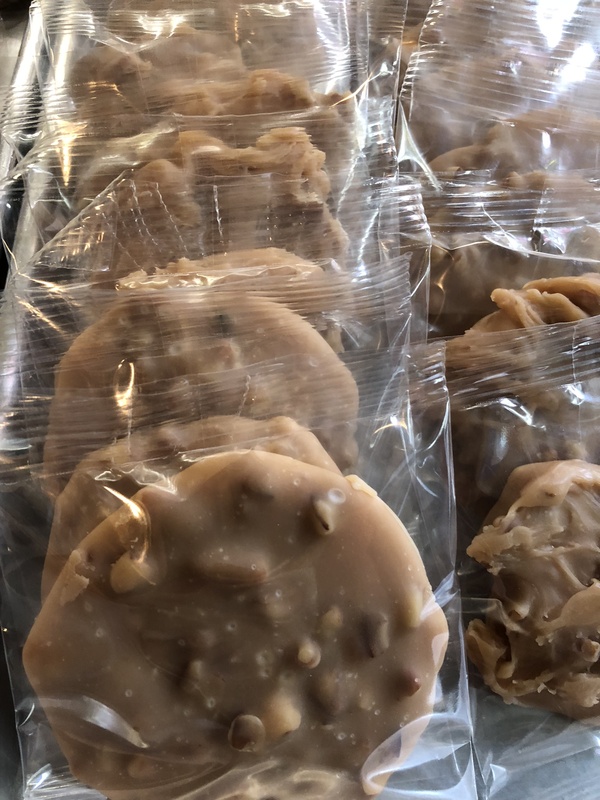 Pralines have a creamy consistency, similar to fudge. And rather simple to make. They are usually made by combining sugar (often brown), butter, cream, milk or even buttermilk, and pecans in a pot over medium-high heat, and stirring constantly until most of the water has evaporated and it has reached a thick texture with a brown color. This is then usually dropped by spoonfuls onto wax paper or a sheet of aluminum foil greased with butter, and left to cool. In New Orleans and Baton Rouge, Louisiana, pralines are sometimes called “pecan candy”. Waiting for the confection to come up to temp. It seems that every where you turn there is a praline or confection shop in the city. And you can learn how to make them at the New Orleans Cooking School. Even though I did not have time on my visit to learn how to make them this recipe is adapted from the cooking school. You can sample some if you just so happen to wander in their general store. To get the true experience you could take a class or just pick some up at any of the numerous candy stores located throughout the city. 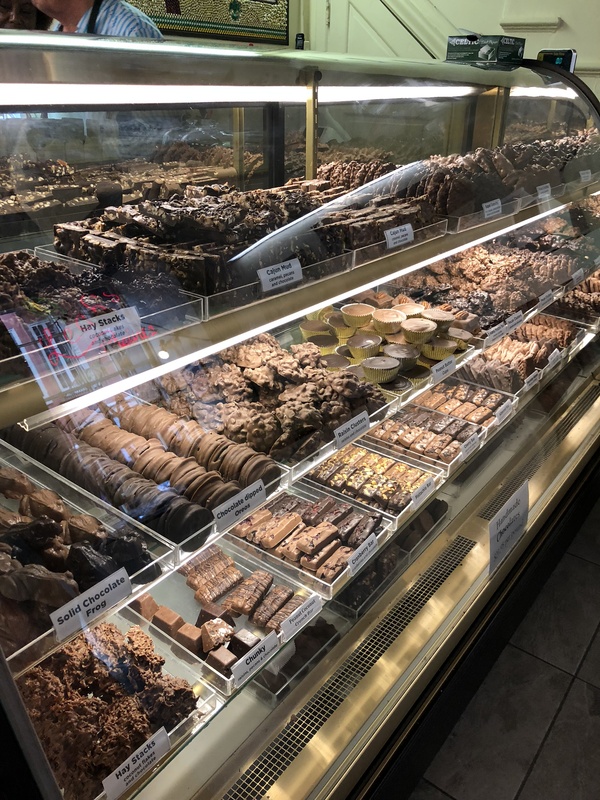 It seems like there is a praline shop one every corner, and if you love them it’s not a bad thing. 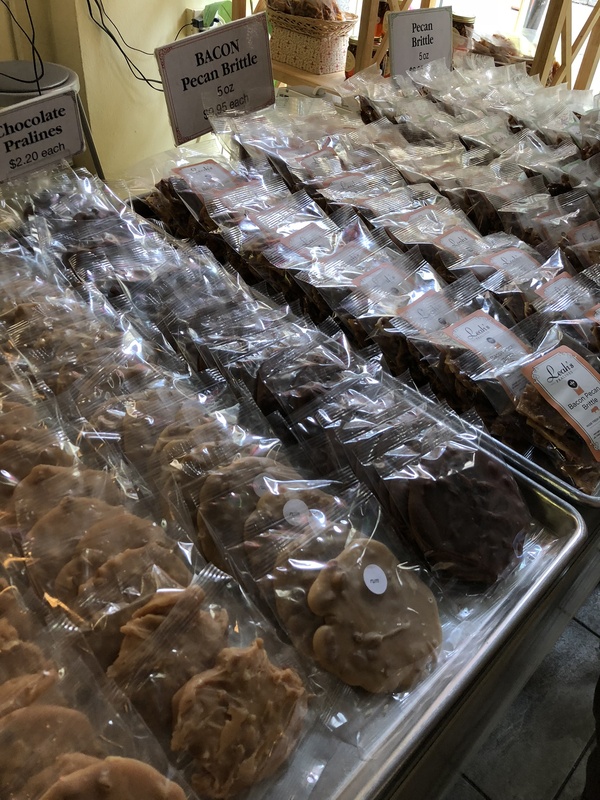 Pralines all lined up for sale. 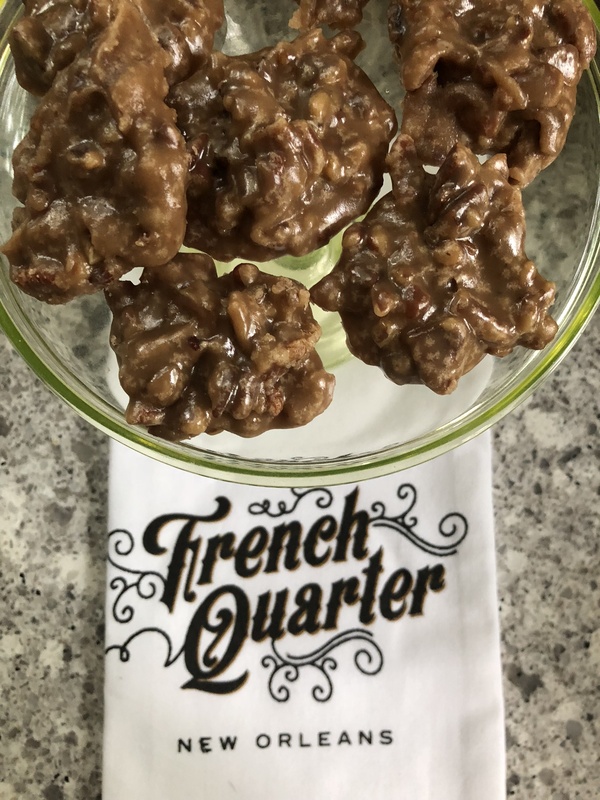 Who wants bacon pecan brittle? The recipe below is from the New Orleans Cooking School that I found online. I used parchment paper instead of a silpat. I toasted my pecans because I think it adds a deeper flavor. (12 ounces) pecans – I like them roughly chopped, but you can leave them whole or chop them more finely. You can also toast the pecans, if desired. Combine all the ingredients in a medium sauce pan, at least 4 quarts. Do not use a smaller pan as the syrup will bubble up during cooking. It’s also harder to stir in a smaller pan. Cook the syrup over medium-high heat, stirring occasionally. When it comes to a boil, start stirring constantly. 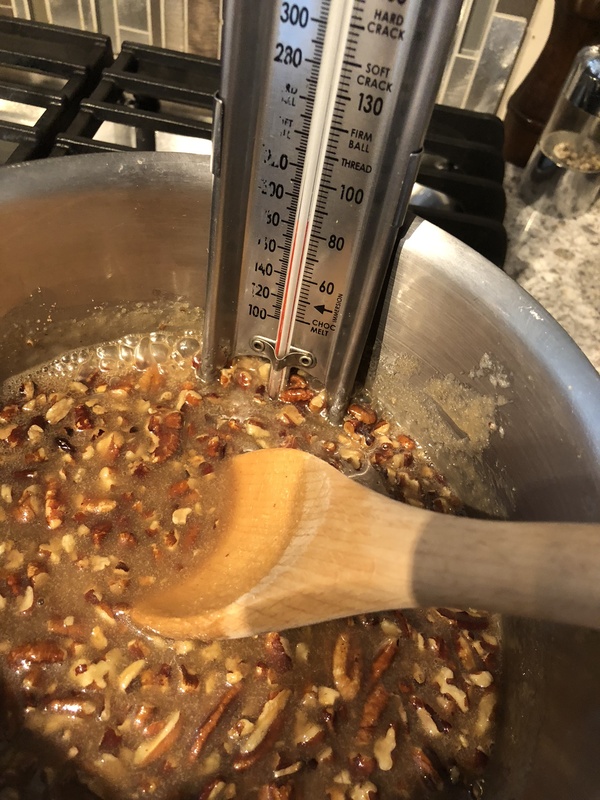 Let it boil for about 3 minutes, until the syrup registers 238°F – 240°F on a candy thermometer. harden for at least ten minutes before eating. They will keep in an airtight container for several days, but they’re at their very best within the first 24 hours of making them! One last thing: don’t forget the pan scrapings! Whatever is left in the pan is the cook’s treat. Scrape those up and eat them with a spoon.